Arsenal keeper Petr Cech said Tuesday he was happy to finally get back the shirt number one he wore throughout his eleven seasons at Chelsea but never with the Gunners. Cech joined Arsenal in 2015 at age 33 so he picked a shirt number 33. “I already wanted number one when I came but it belonged to Wojciech Szczesny at the time,” the 36-year-old Czech keeper told the public Czech Television. 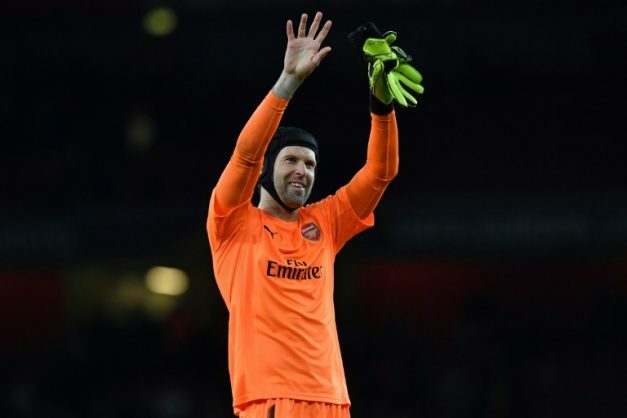 “When they asked me if I would take it this year, of course I was happy to have the opportunity,” added Cech, who has a record 201 clean sheets from 436 Premier League games. When Cech started his top-flight career at Czech side Blsany in 1999, he wore number 12. Then he put on number 17 at Sparta Prague. After his move to Stade Rennes of France in 2002, he wore number 34, but then switched to number one when he joined Chelsea in 2004. He also wore the number-one shirt in the Czech Republic national team, for which he played a record 124 games until his retirement in 2016. Cech is not the only Gunner to get a new number for next season — Elneny has swapped number 35 for 4, Granit Xhaka 29 for 34 and Hector Bellerin 24 for 2, according to the Arsenal website.